Holiday Fun: Fabulous & Festive Forties Style! 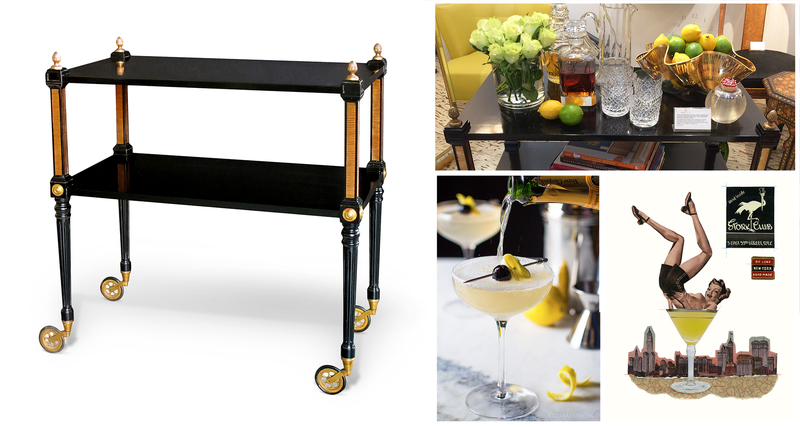 With a nod to forties-era glam, we pair a sophisticated Regency style bar cart with a signature cocktail from New York's Legendary "Stork Club". While this may not be your standard holiday cocktail, it's definitely an impressive drink to serve guests this season! Our Holiday Drinks Service begins (and may, sometimes, end.. ) here. With this sophisticated French 1940's Regency Style Ebonized And Bronze Mounted Drinks Cart In The Manner Of Maison Jansen, Paris 1940's. Fitted with 2 shelves raised on tapering supports in excellent restored condition height: 31" width: 31" depth: 17.5"
Fantasy, luxury and theatricality for a glamorous holiday party; THE recipe for Holiday Fun! This drink is simple and doesn't require a lot of ingredients. Gin, lemon juice, sugar and champagne (This is basically a Tom Collin substituting champagne for soda water ) : "Why yes, we'll have another, thank you!" Fill cocktail shaker 3/4 full with ice. Add gin, lemon juice and sugar, shaking until chilled - 15-20 seconds. Strain into a coupe glass or champagne flute. Garnish with a lemon spiral and cocktail cherry. Optional sugar rimmed glass: use lemon wedge to coat rim of glass, then dip glass in sugar. A Stylish French 1940's Regency Style Ebonized And Bronze Mounted Drinks Cart In The Manner Of Maison Jansen, Paris 1940's. Storied Sips, The Stork Club.